Green lines are for monetization. Red two-way lines are monetized flash content. Light grey lines represent creative direction. Turquoise lines are non-monetized high-res quicktime files. 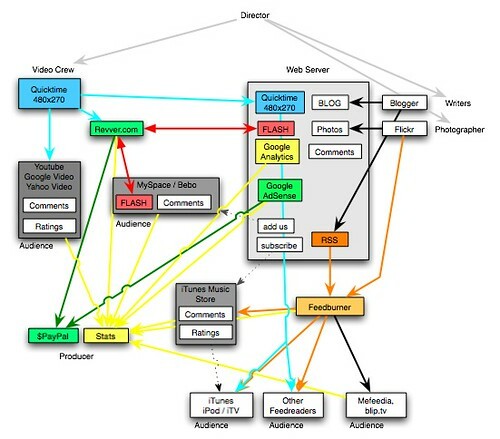 Orange lines are RSS feeds. The light grey box is my server. Darker gery boxes are other people’s servers. shouldnt a guy your age be trying to get laid? he does. well i think he does, he says he does. i don’t know, never mind. but he’s just a friggen genious. Hi, I’m an admin for a group called Flickr Videos, and we’d love to have your photo added to the group. That was ages ago, lol. Mostly I let blip handle all of my content transcoding and web distribution now. Plus, you can count on iTunes to trancsode down when it needs to and focus on putting out a single high quality H264 version o your content.